(Womelsdorf, PA) Bethany Children’s Home is proud to announce the location for their 3rd annual fundraising and marketing campaign, Over The Edge. 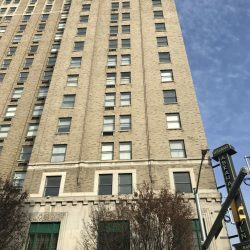 This year Shuman Development Group and The Abraham Lincoln Towers will serve as host to Bethany’s signature rappelling fundraising event. In partnership with VA Productions of Shillington, PA, Bethany uses Over the Edge to create awareness of the services they provide for local youth who have experienced trauma in their lives. Over the Edge, an international company, is known for their unique events all over the world, helping organizations raise millions of dollars. #OTE4BETHANY will be held on September 21, 2018 at the Abraham Lincoln Towers, Reading PA.
All funds raised from the campaign will provide support for the youth served at Bethany.